I’m so excited to be doing my first ever blog post for my dear friend, Tara–and on one of my favorite topics, FOOD! I love making delicious and healthy dinners for my family. Since it’s a grey, damp winter day I’m pulling out one of my old standbys and a family rated “keeper”. Shout out to one of my best friends, Stella, for passing this one along after one of our long doggie walks. My great dane, Skye, LOVES, Stella’s chocolate lab, George…but that romance could be it’s own blog, especially since this is our second generation of a Great Dane/Chocolate Lab connection over the years. Even better–there are just a few ingredients needed for this recipe and cleanup is easy with just one skillet pan. Dinner is ready in a little over 1 hour (including prep). Perfect for those crazy weeknights after getting home from work, having to run the kids around, get the dog walked, etc….or it’s a nice, easy Sunday dinner to kick off the week. From the Can’t Cook Book by Jessica Seinfeld (yep…Jerry’s wife). 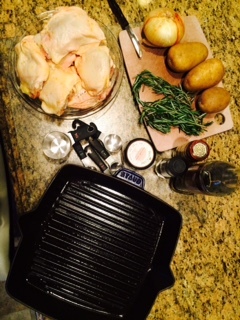 michelle’s musings: For my Staub skillet size, I use 3 potatoes, 1 onion, ¼ cup water and 8 chicken thighs. 1). Heat the oven (with the oven rack in the low position) to 425. 2). Scatter onions over the bottom of a large, oven-proof skillet. Add water. Lay the potatoes over the onions. Drizzle with olive oil. 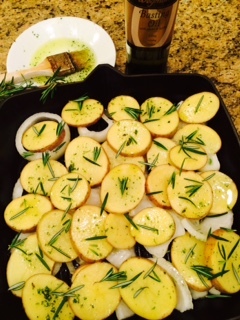 Sprinkle rosemary leaves over the potatoes along with 1 tsp. salt and ¼ tsp. pepper. michelle’s musings: When using Wegman’s Basting Oil, I skip the salt & pepper seasonings here and just brush on the herb oil. 3). Combine the coriander with the remaining salt and pepper. michelle’s musings: You really want to create a good amount of spice rub so I usually eye-ball the spices and add more as I go. This creates a nice, crispy skin. 4). 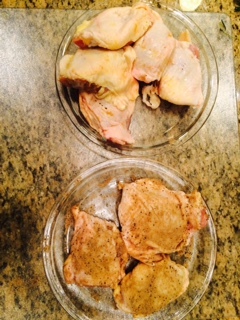 Rub spices into both sides of the chicken pieces. Lay chicken skin side up, over the potatoes. 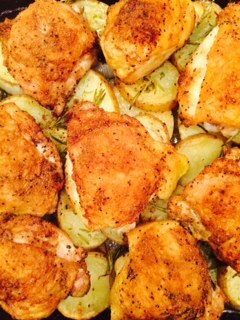 Roast until chicken is cooked through and potatoes are tender, about 1 hour. son’s suggestion: For all of you with “picky” teens…our sixteen-year-old son, likes to add ketchup to his serving. Go figure?! Veggie Side Suggestion: On the flip side, we have a very health conscientious college age daughter, and she loves veggies! For a quick side, I’ll throw what I have handy on a separate pan to roast while this is cooking. For example, asparagus with cherry tomatoes & red onion tossed in some more of the Wegman’s basting olive oil is a fav!